The French Foreign Legion is legionary, or legendary, something that is famous in and of itself. It was formed 180 years ago to help keep the peace in Algeria (which the French massively mess-up) and the rest of the now-disappeared French empire. That corps of soldier had been composed of an ask-no-questions, never surrender, blood-in-the-sand, hardened and escaping individual. If a photograph is worth ten thousand words, I'm not sure what story these pictures tell of the Legion. No doubt these are the best faces in the best spots at the best angles in the best light kind of photographs, and don't really seem to tell any bit of the story of the French Foreign Legion that one would expect. But this was evidently not a real documentarian's divulge that took place here in a double-page spread of the jam-packed issue of The Illustrated London News for 6 September 1913. But perhaps it was--perhaps there was a reading and writing room, and perhaps the barracks were kept clean and light and airy--certainly that would be good for the morale of the fighting man, but just not for our expectations. And truth be told the menu for breakfast looks pretty good. Whether or not this was a standard fare is impossible for me to say. The cook (who looks proud enough to be a chef) could make a person want to pull up a chair to the table. And the game and recreation room, where I see some tea and chess--I'd be very interested to know what the framed documents on the rear wall were all about. Lots of these images have to do with walking and falling, walking and falling at the same time, walking and catching yourself from falling over and over again, but in general that walk is only one step, so far as parachutes go. The parachute has certainly been around for a long time--from ancient times if you squint your eyes hard enough--though it appears that it was in the Renaissance that the idea was taken more seriously as a practicable thing: at least it was first depicted then. Here for example is a form of falling that was seen as flying (Homo Volens or Flying Man), in this depiction of parachute-use by Fausto Veranzio Fausto (1551–1617) in his book of technological marvels called Machinae Novae (1595). Of course Leonardo left a footprint here as well, and before Veranzio. 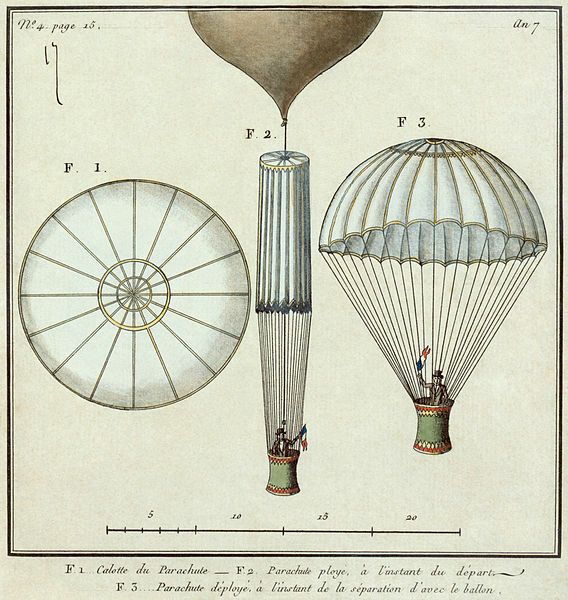 More convincing and potentially beneficial parachutes were constructed for balloon escapes/aviator descents in the 19th century, as seen with the work of André-Jacques Garnerin (1769-1823), who was the inventor of the frameless parachute (a framed version seen below). And in all that time of development through the nineteenth century, it still took another eight or nine years or so after the Wright's flights to have employed the idea for pilots of the modern airplane. There was a series of varied "firsts" of leaving an aeroplane by parachute in 1911 and 1912, the earliest of which involved the pilot of an aircraft to fly with his parachute in his lap, then throwing the whole thing from the plane with the pilot following. Parachute history during this time, like 1910-1920, is a little complicated, filled with fits and starts, mostly not very successful, and most of them of a quality and dependability to make you want to land your aircraft even if you were flying only smoke and flame. "...our illustration appears to be somewhat fantastic..." The ripchord, one of the most important elements of a parachute, didn't get introduced into the fray until about 1916, and the real utility of the parachute doesn't seem to be developed until 1920 or so. In the meantime, the whole business of flying was pretty much being done without a safety net, so to speak. Louis Turner's Review of Published Work on Nuclear Fission, 1934-1940. I've found this article1 by physicist Louis A. Turner to be very helpful over the years. He was an I-was-there guy (and actually an I-am-here guy) who wrote a stuccato article on the history of nuclear fission which was top heavy in references, and did so in 1940, just before the clamp came down on publication on the topic. Certainly there are other more modern efforts in this area that are far more detailed, but few have managed to do so good a job in as limited space as Turner, which the fabulous John A. Wheeler recognized as a "great and timely" review2. 1. Louis Turner. "Nuclear Fission." Lancaster: American Physical Society, 1940. An article in the Reviews of Modern Physics, vol 12/1, January 1940, pp 1-30 of an issue of 85pp Original orange wrappers. Fine condition. Also contains articles by Seaborg and Zwicky. 2. J.A. Wheeler, "Fission in 1939, the Puzzle and the Promise" Annual Reviews, 1989. The original article can be purchased through our blog bookstore, here. E. Fermi, Nature 133, 898 1934. E. Amaldi, O. D'Agostino, F. Rassetti and E. Segrè, Proc. Roy. Soc. A146, 483 1934. I. Noddack, Zeits. f. angew. Chimie. 37, 653 1934. O. D'Agostino and E. Segrè, Gaz. Chim. Ital. 65, 1088 1935. I. Curie, H. von Halban and P. Preiswerk, J. de phys. 6, 361 1935; C.R. 200, 1841 1935; 200, 2079 1935. This is intended to be a short mini-post on the end of printing, and the end of bookselling, such as we know it, or knew it--this image comes from 1499 (Le Grand Danse Macabre, Lyon), and tells us that death to these occupations is nothing new. Of course when we speak of the death of the book nowadays we're discussing something different--the death of the printed format. But here in this print, which is also the first depiction of a mechanized book press, we see ironically that Death has come to claim its operators, or at least two of them. The inkman in the background, the yelling third of a departing party of two, is spared for the time being. Just as the reader is for the first time seeing this machine, they are also seeing Death in its in grim glory snatching away the machine's main operators. The image and the functions of the people working the press are well described in the excellent history of all things books at the Bookn3rd website, here. Here's Death coming for the bookseller--at least the man was reading at the time of the departure. This is also a very early depiction of a book store, which again as the first visual information on such a place to the reader is wrapped around the visitation of the Great Inevitable. The inkman, in thr background, screaming/shocked. I've written quite frequently on this blog about the forensic components of crowds, seeing the interesting bits of smallness inherent in virtually every crowd scene ever made. [For example, see Ephemeral Uniqueness of Large Crowds here, or just enter "crowds" in the "search" box at left.] Today's installment looks at some older representations of crowds, or people or things just packed tightly together. It seems a little trite to lift this image from a superb example of Renaissance printing, and to attach it to a short post about crowds and being crowded, but so be it. The image in question is from the semi-great Hypnerotomachia Poliphili1 (from Greek hypnos, ‘sleep’, eros, ‘love’, and mache, ‘fight’, or something like Poliphilo's Strife of Love in a Dream), which was a dreamscape novel hat was richly illustrated and beautifully designed, if not well written. Be that as it may, whether or not it was/is a dripping romance of sodden accomplishments and drippy sentimentality, it did encompass a weird allegorical element that linked architecture and feminine appreciation of sexuality with Poliphlio's dream-search for his beloved Polia. The book seems to have everything going for it except for a good story line and an author. Be that as it may, I liked this image of Poliphilo entering the woods in his search for love--crowded, dense, low growing branches, and so on. Visually it is very striking with lots of verticals; allegorically, it is extremely sweet. There are no forks yet on the table--they wouldn't come about for another few decades. And what are we to make of this scene--are these students as fearful of their instructor as they seem? No--I think that its all about the book. Books were very expensive when this woodcut was printed in William Caxton's fantastic Mirrour of the World (1481), and so if there was one book allowed for the classroom it was a lot, and all these people were trying to do was to huddle together so that everyone could get a look at the printed page. There's a certain stillness to the crowds above, much more so than most--there's definitely no granular behavior about them, no extra-sensory physics to the ebb and flow. They're mostly just sedentary, but packed closely together. 1. This book was printed almost at the last moment of the 15th century, in December 1499, by Aldus Manutius in Venice. This woodcut comes to us from Biblia: Dat ys De gantze Hillige Schrifft Vordudeschet dorch D. Mart. Luth. Vth der lesten Correctur mercklick vorbetert, and published in Mageburg by Michael Lotter in 1554. I'd say that it depicts the Eath-centered cosmology of the creation just after the introduction of Eve, where everything seems to be in perfection and harmony, there (perhaps) inthe sixth day of the creation story. There doesn't seem to be any sign of the serpent, though Eve does seem to be covering herself in some sort of modesty, even though we are told in the OT that the two humans were naked but not ashamed. Is this the Most Lovely Image of a Woodshop Ever Made? The turner's workshop, from Charles Plumier's L'Art de Tourner, ou de Faire en Perfection Toutes Sortes d'Ouvrages au Tour...and published in 1701. It is spartan except for a large selection of in-place tools, and I can just about hear the room's echoes. The title page for the work is also quite lovely, a piece of airy/baroque, featuring elements of the turner's trade as ornamentation. Not to be confused with another, earlier, engraving by Abraham Bach (the Elder, "d.A") of the same title (published in Nuremberg in the late 17th century), this work by Joseph Uhl (published in the Illustrirte Zeitung, Leipzig, 24 October 1926) seems far more pessimistic, a scene of symmetrical futility. The title translates roughly into the Triumph of the World, or the World Conquers All, or something along those lines, I think, and we definitely see the old orb impassively withstanding whatever it was that was happening on it--and whatever it was, it didn't matter. The cleric at bottom left seems to be extolling the heavens in support of those who ascend the world to his favor (? ), and as they reach the apex they either protect or try to repeal those who are supporting the golden calf. At bottom right we see the ultimate disposition of the players, swept into a pile by an unconcerned sweeper. This is the basic desin that is seen so often through the Medieval and Renaissance periods. No mortal power may stay her spinning wheel. she must be swift by hard necessity. This installment to the thread on the History of Dots takes us to the very first print made in America--John Foster's portrait of Richard Mather. Mather was ordained in England in 1620 but his Puritanism came to be a point of departure for him, and he sailed to America for his taste of religious freedom, arriving in 1635. He was a pastor in Dorchester, Massachusetts, for the next 34 years until his death in 1669 at the age of 73. As it turns out this portrait was made of him by John Foster just prior to his death and was not published until 1670, when Mather--who as it turns out who be the founding member of what would become a long-established and important family of clerics, including Cotton Mather--was already dead for a year. He is shown holding a book, which---since this is the first print made in America--is also the first image of a book. The book is held open by Mather's enormous thumb--and what do we see in this book for words but dots. Perhaps there are some dots, and perhaps there are some dashes, but its close enough for me. I do wonder about that horizontal line running across the image, appearing just under Mather's whiskers. It seems like the woodblock was broken and pieced back together. Perhaps it was just an accident. Perhaps it was broken on purpose so that Foster could use an interchangeable body and replace the head, so that the next series of portraits would be easier for the artist, which he may not have been. He did take the care to render Mather's spectacles, even if they are but little mites of specs. In any event, Foster did a great job with very limited ability, and I think that the great blackness of Mather's body, which formulates the print's large power, may have been done by mistake. It really doesn't matter, as the overall effect works beautifully well. A very full interpretation of this image may be found at HarpWeek, here. The 1939 World's Fair in NYC famously exhibited a spherical attraction that exhibited a semi-robotic display of what the future would be like--a future that was only 21 years away, in 1960. There would be an enormous amount of weight on the shoulders of 1960, given what the World's Fair had to say about it in 1939. Few things were very right, and many of course were necessarily wrong--but that must be the case when looking into the short-ended future with a monstrous amount of anticipation. That--and since this was a feel-good celebration--nobody was talking about the world war that had already started. One thing is for sure--the pavilion's creator, General Motors, did foresee that highways and automobiles will be in high demand up there in the tomorrowland of 1960. The display was designed by the fantastic Norman bel Geddes, who actually expanded on his superhighway theme in the next year with his book Magic Motorways (which can be read here). Anyway people were very excited by the whole affair--waiting in line for a few hours, winding their way through the pavilion to take their seats in a circular gallery overlooking a vast and complex assemblage of miniature societal models, the seating arena rotated to give the viewers views of the entire display. More than 26 million people saw the display over a six month period. 26 million is a big number. Futurama drew as many people in six months as the three New York City baseball teams (the Yankees, Giants and Dodgers) brought in for almost the entire decade. It is also equal to all of the deaths suffered by the Soviet Union during WWII. Again, this is not a wholesale look into the future, just the resurfacing of one of the world's greatest cities. I'm not sure how these domed cities worked. B. Fuller had an idea like this for central Manhattan that I wrote about earlier in this blog, but his idea escaped me too. Here's a big idea: a fantastically oversized, super-heavyweight wind turbine from 1932. This monster was 1400 feet tall, fully 700 feet taller than the tallest modern wind turbine. Actually, by conjecture, it looks as though the wind collecting units (or blades, or whatever these things are) might be 250' long just by themselves, forming collecting space over 500 feet wide. So that's six blades at 250' each per collecting unit, times three. 18 250'-foot long blades per structure. It feels as though you could ride this thing to the Moon. I have no idea how much the structure weighed. "Simply the thing I am shall make me live." --from Jorge Luis Borges, "Shakespeare’s Memory"
It is interesting to pursue a loose thought like this to its not-necessarily logical end. Such is the case with the self-styled Paneuropic ideas of Hermann Soergel (1885-1952), the author of the above. Soergel was a Bauhaus architect and author of a number of works on design and far more ethereal, floating-castle ideas. His most spectacular contribution—incubated in the mid-1920’s and still clinging by its fingertips as an idea among some current thinkers—was to put a dam across the straights of Gibraltar. The dam would generate electricity of course, but most importantly to Soergel, it would also empty an enormous amount of water (lowering the sea by 200 metres) from the Mediterranean leaving vast new expanses of land to be developed and colonized over generations into the future. The water of course would have to go somewhere, and that somewhere was the Sahara Desert, somehow in its wake creating farmable and productive lands. Soergel was creating a certain, very wide, fantastical future of uncertain monumental prospects. A "brief outline" of the idea was published in this four-language pamphlet, Lowering the Mediterranean Irrigating the Sahara (Panropa Project), which was published by J.M. Gebhardt in Leipzig in the very bumpy year of 1929. (The Weimar years in Germany were already into deep bumpiness; the rest of the world would follow suit in October of that year.) To be fair, Soergel didn't plan on emptying the entire Mediterranean, just a bunch of it--at least enough to be able to rename it. [Here's a map of the new Mediterranean, or the Mediterranean that would be made to go away. As you can see at this point Sicily and Italy become enormous, and the Greek Islands are combined to form one large land mass--this last bit alone is enough to form total and complete reisstance to this idea. Also at this stage perhaps 150 or so miles of new lands have been reclaimed from the sea all along its former borders--more so in Turkey. There is no mention as yet of any new islands that are formed in the sea water's wake.] As it turns out Soergel thought that this plan would add at least 660,000 KM2 to the base of the surrounding countries of the Mediterranean, or roughly the equivalent of the combined land masses of Italy and Germany. Having the sea pulled back from hundreds if not thousands of seaside towns and cities would no doubt be a "problem", for them; but that doesn't matter to Soergel, as they were inferior thoughts to the grand idea of emerging a new continent. Great bog (and a good simulation with a powerful computing capacity) only know how the changes in the Mediterranean would affect the climate--well, that in combination with the thousands of new square miles of inland sea and canals in the previous Sahara desert. There are of course many other problems. The master plan at work was that the world would be divided into three economic spheres in the future, all beginning with the letter “A”: American, Asia, and the new land to be created by Soergel, “Atlantropa”, which was the former Europe expanded into the new dry beds of the Mediterranean and North Africa. And also of course Egypt, which would be covered with "thousands" of canals and become semi-submerged by the new borders of the meandering sea. This would be the way for Europa t o compete with the rest of the world in the future. Perhaps it is actually three steps to get from the idea of damming up the straits of Gibraltar to the osmosis of Shakespeare’s memories into someone else’s brain—a squinting acquiescence of the middle touch being the brilliant Jorge Luis Borges. You see it was in the Argentine master’s last published story, "Shakespeare’s Memory", that we meet Herr Soergel (as Hermann Sorgel) again. But so far as I can remember Soergel exists only as a fictional character, with no reference to his real-life self. In this wonderful story, Soergel inherits the memories of William Shakespeare—these bits come to him slowly but surely, until they start to conflict with his own memory, and things get difficult. The man with Shakespeare’s memories winds up phoning strangers on the telephone, giving them away at random, until Soergel is left with his own mind again. Superior as Bill’s memories were, they still weren’t Hermann’s, who wanted his own life back in the end. I'm sorry to report that at the end of it all, near the end of the pamphlet, Soergel releases his opinion on the political importance of his project. And yes, his aim was to form an alliance between the new PanAmerica (of the "three Americas" with the new Pan-European African Union to thwart "the yellow peril" which "arises from the racial antipathy of India, China and Japan. Soergel writes that "the fate of occidental civilization...will be settled on the Mediterranean". After it is all said and done, perhaps the best reiew of the work by Soergel is provided by the graphic designer who put the Big Red X on the cover of his work. It fits. (Part of a new series on the mapping of imaginary places.) My thanks to Natalie Bouchard (Montreal, PQ, Canada) for suggesting this map. This is an old , seemingly simple but somewhat deceptive map, drawn for the work of Madeleine de Scudery’s (1607-1701) novel Clelie, and published in 1654. It is for all intents and purposes a little more than its stated name (Tenderness, Carte de Tendre), diving deeper in the psycho/sexual area than anything else. On the other hand it may be exactly what you want it to be--evidently many people did, as this map turned out to be used as a very popular proto-game board in polite Salons. As a map of friendship and caring and love and sexual adventure, it is interesting that what seems (to me) to be the stand-alone focal point battling for our initial attention is the The Lake of Indifference--it just seems to me to be the first thing that the eye sees, the map's most dominant geographical fixture. It is not the largest feature, nor the most spectacular, but it does seem to capture the essence of what may be one of the most ordinal of sins: indifference is a suffocating malaise, a semi-disease, that covers an extraordinary amount of ground without even trying, a force invisible and while so immutable, a host to all manner of impending failures. Indifference may be the worst thing going for humanity in general, as it allows oxygen for so much of the nastiness to burn. Solidified hate is a much easier thing to deal with and potentially manage than a hate distilled and vaporous and filtered to a greater number of uncaring/discaring people. And speaking of impending doom, one of the other main features of the map is the long, semi-straight river that feeds into the body of water at the top, the Sea of Danger. Now the Sea of Danger doesn't appear so dangerous, except for the jagged island bits exploding from its calm, flat and not-detailed surface, though perhaps that is the very point. The large river is called the Inclination--translated to a natural disposition, a "normal" way of doing things, a common bent, which means that the mapmaker says that our standard approach to life is to head towards the deceptive sea of danger. Even though we are headed that way it doesn't mean that we can get off the river and visit, or stay, in any of the many towns that we see along the way. There are a number of alluring towns with charming names: alacrity/cheery readiness (Empressement); assiduity (Assiduite); eagreness (Empressement); favors (of perhaps a sexual kind, Grands Services); (lasting) friendship (Constante Amitie); kindness (Complaisance); obedience (obaissance); pampering (Petits Soins); sensibility (Sensibilite); submission (Soumission); and tenderness (Tendresse) are all places calling out for attention. The other town names are further indications of the personal stabilities that are the goals of most people: wit, sincerity, generosity, punctuality, respectfulness and goodness. There's also those other places, towns of a more sinister and betrayed nature that form a north-south line east and west of the river: Negligence, Inegalite, Tiedeur (tepidity), Legerete (lightness, not being there), Complaisance, Perfide, Meschancete (wickedness), and so on. And don't forget the town of Oubli (oblivion). At the last moment, before entering the Sea of Danger (which is fed in the east by the much more volatile waters of the Mer de Inimittie (Sea of Enmite) , the River Inclination is joined by the smaller rivers of Estime (Respect) and Reconnaissance (Gratitude), a mixing of waters all coming together at the same point, a combination that I do not understand. I have no doubt that there are abundant clues to all of this throughout the ten volumes of her novel, but I can't give Mme. de Scudery that much time. Maybe none of the placements and proximities in this map matter--maybe the rivers are flowing backwards or something, being filled by the waters from the Sea of Danger. Maybe this isn't a map at all, but just a suggestion of what stuff might look like, a spatial suggestion of the concept of emotion. Or maybe it is just a board for a polite game.